Earlier today, the Bureau of Labor and Statistics (BLS) reported that the unemployment rate for post-9/11 veterans* decreased from 5.7 percent in January 2016 to 4.7 percent in February 2016. 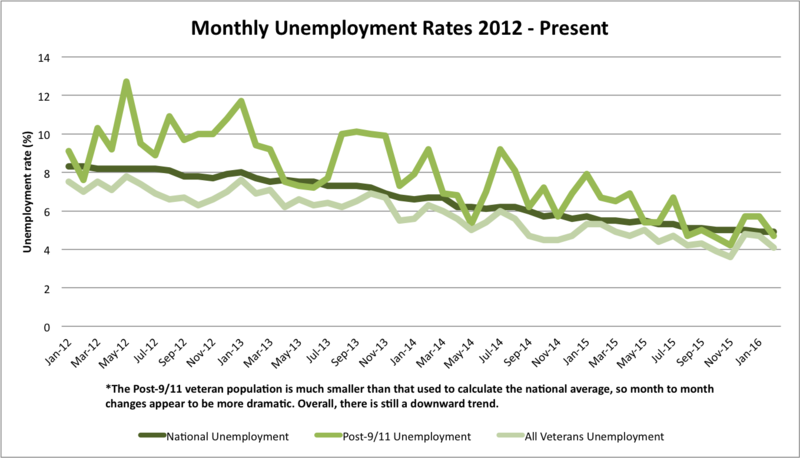 Among all veterans, unemployment rates decreased from 4.7 percent in January 2016 to 4.1 percent in February 2016. The national unemployment rate remained unchanged at 4.9 percent in February. 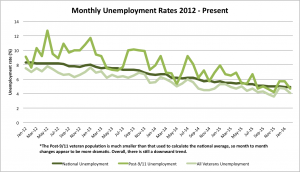 While unemployment rates for veterans remain low, there are still actions policy makers can take to improve the transition from military to civilian employment. This past week, the Sergeant Major of the Army Daniel A. Dailey met with Congress to discuss the importance of credentialing for soldiers. Credentialing allows military service members to receive certifications that show they have the necessary skills to do a particular job. Veterans can use these certifications to demonstrate transferable skills gained from their military service, for example, training as an electrician or medical specialist, which can give them a boost in the civilian job market. A variety of credentialing programs exist through each branch of the military. However, credentialing requirements vary from state to state and may be expensive, which limits their accessibility and usability across state lines. The Army has credentialed more than 30,000 soldiers so far, and credentialing could become more accessible to soldiers by making tuition assistance funds available to help offset the costs. In IAVA’s Policy Agenda we emphasize the importance of easing credentialing and licensing processes for not just service members, but also military families. While many states have made headway in these areas, Congress and state and local officials must continue to work together to ease service members’ transition to civilian employment. Policy makers can also invest in the success of veterans after service by continuing efforts to account for military service when crafting requirements for state certifications and licenses. 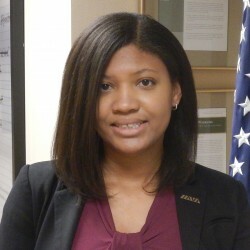 For more suggestions on how the public, private and non-profit sectors can work together to strengthen support for veterans’ transition to the civilian workplace, please see IAVA’s 2015 Policy Agenda. * Unemployment rates for the post-9/11 generation tend to show more variability, in large part because of the small population sample size used to calculate this rate.